As soon as you walk out of Pauley’s Pups, you’ll be carrying the responsibility of a growing puppy in your hands. The first few months of a dog’s diet are crucial to set them up for a happy and healthy life. While it’s always good to consult your veterinarian about your particular dog and the special needs of its breed, we have some general advice to give you an idea of what to expect in the first year or so. Most puppies feed off their mother’s milk until they’re about four weeks old. At that point, they’re slowly weaned into eating solid food over the course of a few weeks. To ease the transition, food might be softened by soaking it in a little water. Puppies should eat food designed specifically for their age, as nutritional needs are constantly changing and evolving to support the rapid growth of their bones, muscles, and vital organs. Some food might be better for large breed dogs and the unique demands of their bodies. All of this information should be displayed on the dog food packaging. As your puppy grows, it’s important to monitor it’s activity and energy levels. If something seems off, consult with your vet to make sure you’re feeding your puppy the right type and amount of food. A quick examination of puppy poop can assure you that the food is being properly and fully digested. You should switch over to adult food just as your puppy seems to be closing in on its full size. In this case, every breed is slightly different. 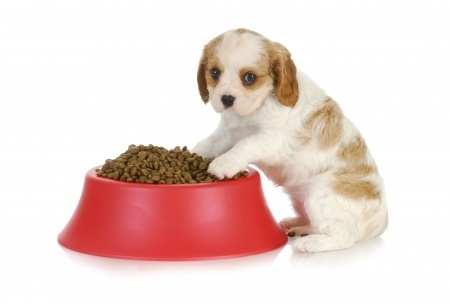 During the puppy food stage, feeding three times a day is ideal to support metabolism and provide the proper energy. The amount of food you should feed your puppy constantly changes, but generally the younger the dog is the more they should be eating. There are feeding charts on most dog food packaging based on the age and weight of your dog. The amount of food a puppy needs to grow should begin decreasing about five months into a puppy’s life. Owners love to satisfy an excited puppy with special treats, but it’s important to show restraint, as puppy treats often provide extra calories without the nutritional benefit of regular food. Like anything else, the amount of treats fed to your puppy should depend on its breed and size. Some “human” food, like certain vegetables, can be okay for your puppy to eat, but you should definitely avoid serving table scraps as it encourages begging. You should also do some research into foods that are harmful and toxic to your dog. You might be surprised at what’s included on the list. At Pauley’s Pups, we like to know that every puppy we sell is treated with the proper care, growing into a healthy adult dog. Consult with your vet for more information to keep your puppy on the right track.